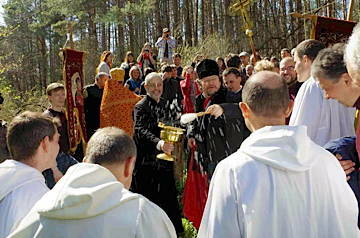 In April 2015, a stage of the pilgrimage of trust took place in Ukraine. 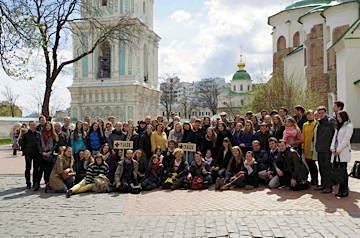 After the Easter celebrations in Moscow and two days spent in Minsk, Brother Alois and four brothers of the community arrived in Kiev together with young people from different cities in Ukraine and from all over Europe. These visits were particularly marked by the suffering caused by the war in the east, but also by the hope brought by the season of Easter. Here are a few reflections on these six days, along with testimonies from some of the young participants. The preparation for the pilgrimage of trust in Kyiv lasted for 2 months; all in all about 50 volunteers were helping in different teams: welcome, transport, meals, accommodation, seminars, prayer and liturgy. Christians from different denominations worked together. Sometimes, for example, Greek-catholics helped to organize the meeting in Orthodox parishes, and they cared about the meeting as if it were in their own church. For me, it was such a great, visible sign of people united in the name of Christ. Just as arrived in Kyiv, on Monday afternoon, Elena, our host mother, drove us to her house and introduced us to the rest of the family: Alexander, Lucia, the grandparents and Lisa, their niece, who had had to move from Luhansk to Kyiv because of the war. Immediately we felt at home. After the long trip we didn’t expect we would have the energy to talk with them for hours and hours. 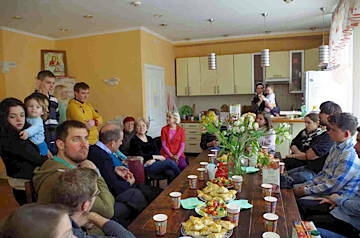 They fed us, both physically - with local food from “borsch” to “varenyky” - and spiritually. “We took part in the Maidan revolution of dignity. Every time one of us went out into the streets and one stayed at home with Lucia, our four year old baby. We wanted to be sure that whatever happened there would be someone left to take care of her”. Being with them helped us to understand that there is no courage without having faith in the prayers of others. The hospitality of the people of Ukraine is impressive. In a monastery, with refugees or at our host family, everyone welcomed us warmly, with great joy and a lot of food and drink. Together with our host ’mama’, we prepared a traditional supper for the last night. It was a wonderful moment of fellowship. Thursday morning, in the bright sunshine, we went to the Lavra of the Caves. Welcomed and guided by some of the seminarians we visited parts of this huge monastery. The golden domes, emerald roofs and white walls decorated with paintings stood out clearly against the blue sky. We visited nearby wineries where relics of the Saints are preserved. The Lavra is the place that contains the most relics in the world: 120 saints! The visit ended with a time of recollection before the relic of the head of St. Clement, the first bishop of Rome after Peter. A beautiful visit carried by the enthusiasm of our guide and his anecdotes. Next everyone went to a restaurant popular with students for a typical Ukrainian meal. After that a meeting was proposed at the Mohyla University, with the philosophers Constantin Sigov (from Kiev) and Alexander Filonenko (Kharkiv). Their introduction by the two men and the sharing with the young people gave an opportunity to present some aspects of the country’s present situation. 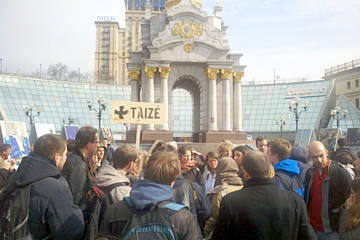 Then it was time to head off to one of the big places in the recent history of the country, Maidan Square. On our first full day in Kyiv we visited Maidan square and spoke with people who told us that they experienced Maidan as a place of solidarity, hope, unity and prayer. We walked up the hill where over a hundred people of all ages were killed by snipers when the situation escalated. Outside the ecumenical memorial chapel on top of the hill we had a very touching prayer with a Greek Catholic Bishop in memory of the “Heavenly Hundred” and everybody placed a candle in front of their pictures. The prayer itself was very moving but there was one thing that made it even more special: The people on the street who stopped for a moment to join in with our prayer. During the 2014 revolution, protesters were killed by snipers. 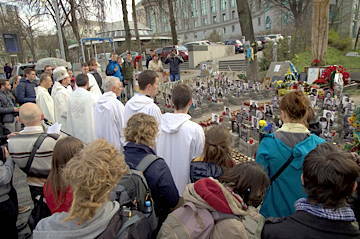 We commemorated these victims, now referred to as the ’heavenly hundred’, in a prayer ceremony near Maidan Square. I witnessed the impact of the Ukrainian conflict in my own society when flight MH17 was shot over Eastern Ukraine. 193 Dutch citizens died in that event. Looking the Maidan victims in the eyes, for me all who have suffered from this conflict were included in the prayer. In the evening, everyone went to the botanical garden, for the last appointment of this intense day: a meeting at the Trinity St. John Monastery with Father Jonas, an Orthodox Bishop, monks and young Orthodox people who gather there every Thursday night. We joined the youth meeting held every week in the monastery by its monks. The format of the gathering was ’question and answer’. What struck me most was the fact that the discussion was very informal and lively. The monks joked and laughed a lot and I didn’t feel there was any distance between us. I think it’s very important that priests and monks talk to people in an informal way creating a friendly atmosphere. Though someone told me that the discussion was not serious enough, I think that different formats within one denomination must exist and the monks were very good at switching from jokes to more serious topics. By bus, the participants left Kyiv for the village of Lishnya, about thirty kilometers away. Father Filaret, who has been several times to Taizé, presided over the liturgy. After a short night it was time to visit the town of Lishnya, just outside of Kiev. For me, it was the second experience of the Orthodox Eucharistic Liturgy. For me it was one the best experiences during the meeting. Thanks to the translation, I actually felt like part of the service. Because it was in a normal church, instead of a big cathedral, it made the service even more special. And at last, because most of us could not receive communion, they distributed blessed bread, which made us truly feel united in Christ. After the liturgy, a great meal was prepared by grandmothers of the parish and the Orthodox Bishop Hilarion led us all in procession to a spring in the forest, a few kilometers from the church. There, on this feast day of Mary Mother of God, everyone was blessed by the fountain. Then another great meal had been prepared under the trees in a clearing. What a welcome! On our return to the city, an evening service, followed by prayer around the cross at the Greek Catholic Resurrection Cathedral. The Major Archbishop of the Ukrainian Greek-Catholic Church, Sviatoslav Shevchuk was present and addressed the brothers and young people. We met refugee family from Eastern Ukraine and Crimea. Despite all they have been through and the little hope they have to go back to their home, I was struck by their confidence in God and all the love and forgiveness they are spreading around them. 300 wounded soldiers with different levels of severity of injuries - some conscious, others not, are currently being treated in the military hospital in Kiev. It is hard to understand how some of them can still keep smiling and light-hearted. One of the young soldiers, who is 21 years old, came from the front to have his leg amputated. I will celebrate my 21st birthday in two weeks, and yet how little of life have my eyes encountered compared to him. This visit will leave a strong reminder to live with an open heart, as it is at the foundation of human relationship. I live in a country that has not been at war for 200 years. Visiting wounded soldiers at a military hospital was very emotional for me. As soon as I entered and saw the pictures and letters that young children of Ukraine had made to support the soldiers I could feel tears in my eyes. I asked an officer about what we young people can do when we get back home to give support, and he answered “You are here. That already is enough”. By late afternoon, in the Orthodox Cathedral of the Transfiguration all the pilgrims listened to a small children’s choir singing traditional Ukrainian songs, and then took part in the vespers. The priest welcomed everyone very warmly. After a last meal in the host families, it was time to head to the main station: a coach of the Kyiv-Lviv train had been reserved to transfer the participants to the largest city in Galicia, in the west of the country. After a night on the train, made short by the discussions which continued late, the participants were welcomed by a large team of young people and families in the city who were waiting at the station very early in the morning. After breakfast in the families, the participants split into different parishes for the Sunday Eucharist. The welcome was very warm again. Often shared meals allowed the whole parish to meet the young people, all being eager to get acquainted with them. I came back from the pilgrimage in Ukraine with a lot of impressions. For the first time I participated in a Greek Catholic Liturgy and learned about that part of the Church which I didn’t know before. The church was full of people standing. It seems that faith in Lviv is very alive. The hospitality of the local people was amazing. I didn’t see such hospitality anywhere else in Europe. 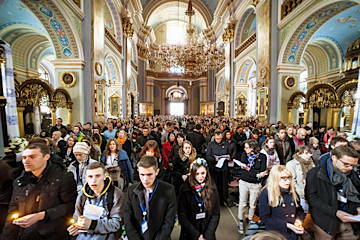 All the participants gathered in one of the largest churches in Lviv for a final prayer in the afternoon. Many Christians from the city came to join them, so that the assembly even overflowed into the street. Many young people of the city and the region then invited the pilgrims to participate in a traditional folk festival "celebrating the joy of the Resurrection together," happy to share joyful dances and songs at the end of this pilgrimage.